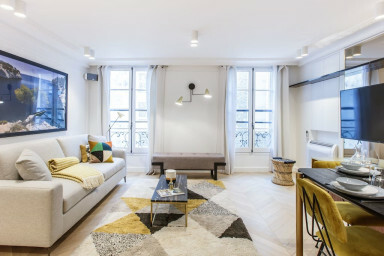 Glorious 75sqm apartment with 2 bedrooms and 2 bathrooms for up to 6 people in the best part of rue Saint Honoré, the most trendy area of Paris. The apartment has been entirely decorated to the highest standard with quality fittings and fixtures. This wonderful apartment is on the 4th floor with an elevator, it's also very quiet as it gives onto a courtyard. The apartment offers a superb living room with a large, modern semi-open kitchen. You could enjoy a family meeting or a business reunion on the large and splendid tailor-made wooden table. Bedroom 1 with an ensuite bathroom and a king size bed. Bedroom 2 with an ensuite bathroom and a queen size bed. The whole apartment offers a lot of storage, A/C available in every room, floor heating available in every bathroom. You can access your apartment as soon as it's ready, if you arrive early our employee on site would help you to store your luggage. We are always available by phone or chat if you need anything.